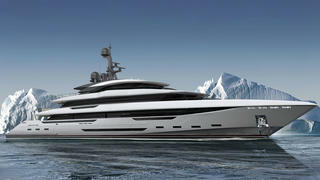 Italian shipyard Rossinavi has announced the sale of a new 70 metre yacht named King Shark in a direct deal. The yacht will be built at Rossinavi’s Viareggio facility with naval architecture being supplied by Arrabito Naval Architects. King Shark features a design focused on exploration and, as well as being built to Rina and Lloyd’s certification, will be ice class certified. Her point of difference however, say Rossinavi, is that the emphasis remains on the yachting lifestyle giving her owners the option to cruise the warm waters of the Caribbean and the freezing conditions of Antarctica in the same level of luxury. Exterior and interior design on King Shark comes from Team For Design – Enrico Gobbi with accommodation for 12 guests split across six cabins along with a crew capacity of 17. Key features include a private owners deck with a hot tub and large living/dining area and a large main deck featuring a superyacht pool aft, cinema room and large spa with massage room, wellness are, hammam and superyacht gym. With a gross tonnage of 1560, Rossinavi estimates King Shark will have a top speed of 17 knots and range of more than 6,000nm when cruising at 15 knots. “We are very satisfied to be chosen again for this mega yacht construction and especially in this ice classification,” commented Rossinavi COO Federico Rossi. Other projects currently under development at the Italian yard include 48 metre explorer yacht Argo, designed by Ken Freivokh, and in-build P63 metre Project Vector.